Michele Wheatly was named Vice Chancellor and Provost in March 2016 and assumed her new role in May 2016. 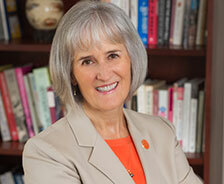 Wheatly comes to Syracuse University from West Virginia University, where she was professor of biology and served as Provost from January 2010 to June 2014. Previously, she was dean of science and math (2002-09) and chair of biology (1994-2002) at Wright State University. Wheatly ascended the academic ranks at the University of Florida (1984-1994) and undertook postdoctoral training at the University of Calgary, Canada, (1980-1984) after earning both a Ph.D. (1980) and B.Sc. (Hons., 1977) at Birmingham University in the United Kingdom. Born and raised in London, she became a naturalized U.S. citizen in 2003. As provost of a state flagship land-grant university with an academic health center, Wheatly partnered with the vice president of health affairs (in a tripartite administration with the CFO) to lead the institution’s first comprehensive unified strategic plan, to establish a single clinical enterprise, to launch a School of Public Health, and to acquire a CTSI. Wheatly has served on the executive committee of the Association of Public and Land-grant Universities’ (APLU) Council on Academic Affairs and Commission on the Science and Mathematics Teacher Imperative. She is recognized as a national thought leader on building partnerships around education, economic development, and health care (keynoted at the University Economic Development Association and the APLU’s Commission on Innovation, Competitiveness, and Economic Prosperity). She is also a passionate proponent of inclusive excellence, promoting access for and the success of women, people of color, and people with disabilities in the knowledge economy. Her work on universal access to STEM has received Congressional recognition (2004), and she co-convened the National Science Foundation (NSF) conference for presidents/provosts of ADVANCE IT institutions. An internationally recognized scholar/educator (and presidential medalist in 1988), Professor Wheatly has been continuously funded by NSF ($25.4 million over 30 years) and has contributed substantially to her field (110 papers, 190 abstracts, 29 colloquia, 22 research students). She has been an officer in her professional associations and served on federal agency panels and editorial boards. Her scholarship interests include the comparative physiology of crustaceans, the logic of epithelial Ca transport, biologically inspired adaptive interfaces, bio complexity, and access to STEM careers for members of underrepresented groups. She has traveled widely in pursuit of her research agenda, including studying as a Fulbright Scholar in the Middle East and serving as an NSF EPSCoR (Experimental Program to Stimulate Competitive Research) delegate to Ireland.